CGIAR country consultations: improving collaboration in agricultural research to support national agricultural development objectives. CGIAR organised in the past two months national consultations in Nigeria, Tanzania, and Ethiopia. The consultations launched a process to strengthen collaboration among CGIAR centers towards a more collective support of national agricultural research and development goals. 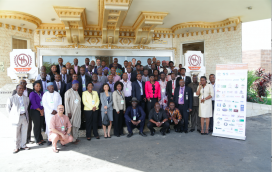 The Abuja, Dar es Salaam, and Addis Ababa venues were full with about 70 participants from CGIAR and a large number of national stakeholders (from government, research, development organizations, civil society, funding agencies, farmer groups, and private sector). The consultations devoted considerable time to listening to national agricultural development strategies and plans and agricultural research priorities. CGIAR also shared information on current research activities in the countries and future plans. Building on that, participants met in small groups to discuss key elements constituting a country integration plan and then the process for completing the plan. Some concerns that should be addressed were raised, including the lack of visibility of some of the CGIAR work, insufficient commitment to country priorities, and unclear boundaries among CGIAR centers, between CGIAR and national organizations, and between research and development.